More than 85% of Americans suffer from back or neck pain at some point during their lives. Many have chronic pain due to poor posture. Generation Xers and Millennials tend to spend most of their working day, and a large percentage of their leisure time, sitting in front of a computer or another screen. Maintaining good posture has become difficult. We spend hours at our computer, hunched over a keyboard, our laptop, tablet, or phone which leads to muscle soreness in our neck and back, as well as spinal alignment issues. In fact, there is even a name for this condition – tech neck! America’s lifestyle has become more sedentary. As a consequence, a substantial portion of our population suffers from the pain, discomfort, and other adverse effects of bad posture. Most physicians agree the only way to permanently improve your posture is to make changes to the way you sit. The reality is poor posture is a habit that can be challenging to break. Our muscles have a memory and can become tight over time. We forget to sit up straight because we are focused on our work, a television show or other activity, and our shoulders naturally slump forward. Trying to readjust your position can be difficult if you’ve spent months or even years slouching. There are many ways those with back and neck pain can help themselves stand or sit up straight and improve their posture. Posture braces are an accessible and affordable option. Applying heat to the area and stretching can alleviate discomfort. Treatment by a physical therapist, masseuse or chiropractor can help in extreme cases. The UPRIGHT GO is a new wearable trainer that focuses on improving posture. It uses sensors to give you a reminder whenever you slouch. According to the Israeli company, Upright Technologies, wearers will see and feel improved posture in as little as two weeks. What’s in the UPRIGHT GO Package? The first thing you notice is the elegant and stylish UPRIGHT GO packaging. Inside you will find a small travel case, Micro USB charging cable, five double-sided silicon adhesive patches to attach the device to the wearer’s body, and a users manual. The GO device sensor is only 4 ¼ inches long, 1 ½ inches wide, and 1-inch thick, and weighs approximately 25 grams or half a pound. Made of silicone rubber, it fits comfortably and invisibly underneath your clothing next to your skin. It has a rechargeable, 3.7V lithium-ion battery inside. It isn’t waterproof, but it is water resistant, so sweating will not harm the device. You need a smartphone with Bluetooth to pair with and use the device. The UPRIGHT GO trainer is small and lightweight, constructed of one-piece, smooth silicone with an LED indicator light on top. The trainer is small enough to fit unobtrusively under your clothes. The entire top acts as the setup and on/off button. When you use the UPRIGHT GO, you receive feedback either from the LED indicator light on top turning on or by the unit vibrating. You can download the phone app, available for an Android or an iOS device, for free. The app has some simple, clear screens, including a calibration screen, training mode screen, and a tracking screen that will provide you with visual feedback on your progress. The first step is to charge your UPRIGHT GO and download the free app. Once it is fully charged, tap the setup button on your phone to connect to the UPRIGHT. Once your app indicates it is searching for your device, press and hold the GO for five seconds until you see the LED light begin to blink. After about 30 seconds the app will indicate that it has successfully paired with your GO. Using the double-sided alcohol pads that come with the device, place your GO in the small of your back, right below the third vertebrae. Once it is in place, sit up as straight as you can. Don’t exaggerate your posture but sit in a comfortable, upright position. The best way to do this is to pull in your belly button, roll your shoulders back and drop them straight down, and relax. Once you are sitting upright and comfortable, tap the button. This will calibrate the device to your specific posture. You need to do this each time you wear the device. Training mode provides you with instant feedback whenever you begin to slouch or walk hunched over. In this mode, the GO checks your posture every few seconds. If you are not sitting upright, the device will vibrate. You can adjust the intensity and length of time the GO vibrates using the app. Most people find that after a few days, the frequency of the vibrations diminish as you start to maintain good posture subconsciously. Observation mode is a great way to regularly check on your progress once you get used to the device. When you set it for this mode, you won’t get a vibration each time you slouch. However, the device will automatically track your posture throughout the day. There is a pie chart that will show the percentage of time you slouched versus sat upright, the amount of time the percentages equate to, and the times of day you slouched or sat up correctly. 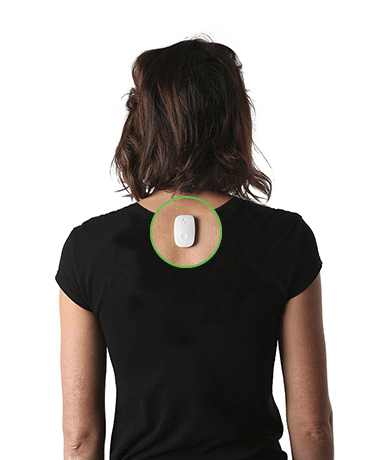 The tracking is color-coded, with green for proper posture and red for when you slouched. The app keeps a historical record, so you can go back and review the previous days or weeks. You can switch back to training mode at any time while the observation mode continues to record your progress automatically. Retail price for the UPRIGHT GO is $99, and the shipping is free. The company also provides a 30-day, money-back guarantee along with a two-year warranty. They also offer online app support. The UPRIGHT GO provides you with a simple, fun way to improve your posture. The device is simple to use, and the app is well-designed and easy to set up and understand. The transmitter is small and slim enough that it can go unnoticed even under tightest of clothes. The device does what it promises to do. Most people will see an improvement in his or her posture within a week. Eventually, you may go through an entire day without getting one “vibe,” and you will instinctually maintain good posture. The majority of users find this device does exactly what it says and helps them to improve their posture even after years of slouching. Most of the reviews on Amazon are 5-stars. The only disadvantage of this device is that it won’t work if you are engaging in too much physical activity like jogging and the adhesives will fail. When you go to the gym you can remove it, then reattach and recalibrate it when you are done exercising.